prior to a wedding, you literally need to think of a thousand things. Location, guest list, seating plan and so many more. 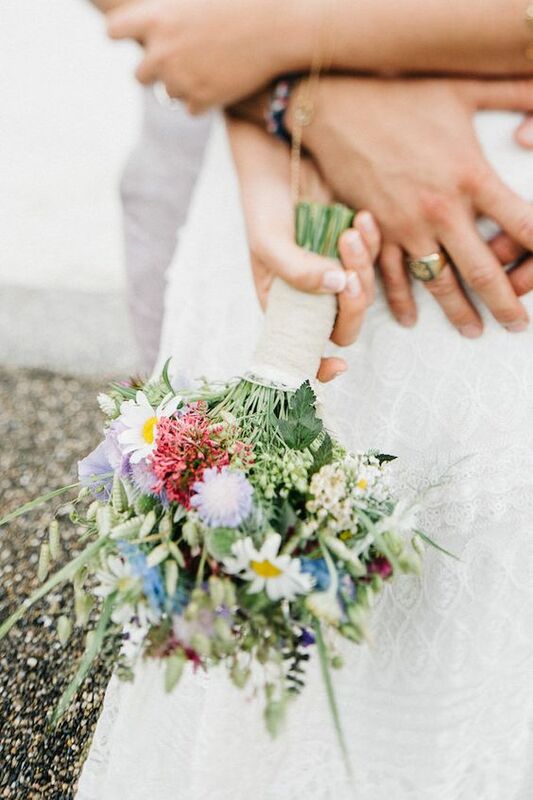 The to-do lists are stacked up in a pile on the floor, your calendar is full of dress fittings and meetings with your caterer and florist and even for the most relaxed bride it all becomes nerve wrecking after a while. We are happily celebrating our 10 year wedding anniversary this year which I think is a great occasion to tell you about how we got married. Our wedding took place only two months after we got engaged which is why we didn’t even have time to hire a photographer, get a massive wedding cake or a limousine to pick us up from the register office. We didn’t have a musician, white doves or a bunch of bridesmaids, and even our parents met on our wedding day for the very first time. But because this day was about us much rather than about all the things you feel like you have to do for a wedding, it was the best ceremony I could have imagined. It was all about us and celebrating with our closest friends and family. And therefore, if you’re feeling a bit overwhelmed or stressed out with everything, just turn off your phone for a while, make yourself comfortable with a cup of tea and simply rely on yourself. If you enjoy your special day, have your friends and family around and just focus on being happy, your wedding is going to be perfect. And as a fashion blogger, of course I feel extra great when I love my outfit, from which my wedding day was not an exception. Therefore, I have put together a selection of the most beautiful looks for the civil wedding. I’ve included everything from high street to high end and hope you have fun browsing through them. 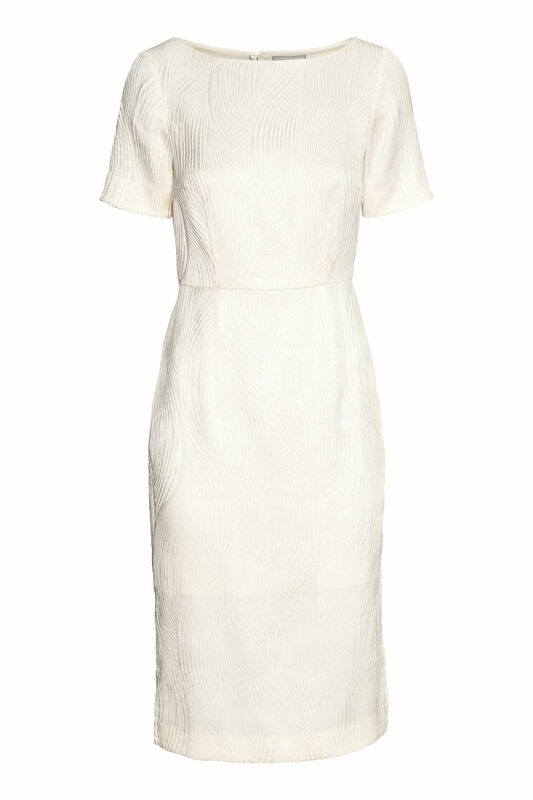 This dress made from Jacquard is perfect for a wedding in spring. Its pattern looks super sophisticated whereas the clean and classic cut leaves room for accessories or a special make up look. I especially like that the dress is very versatile and you can get a lot of wear out of it after your wedding day. If you feel like wearing a more casual, yet very elegant outfit on your wedding day, how about this co-ord? Its color and cut are super flattering and although the pieces themselves are very unpretentious, this outfit will underline your natural beauty and make you feel confident and comfortable. As suits are a great thing in fashion anyway, this suit will be a favourite of yours long after your wedding. If you are lucky enough to tie the knot in a garden, a castle or another fairytale-esque location or you are a bit on the romantic, playful side of fashion anyway, maybe this dress could suit you. Many modern lace details and its skater skirt make it the perfect little sister to your long wedding dress but definitely looks great for its own, too. Maje is a relatively affordable label but the pieces are made from a heavy fabric, have a thought-through design and their quality is absolutely amazing. This outfit would have been met-gala worthy! If you feel like making the registry your catwalk, I would recommend this look. 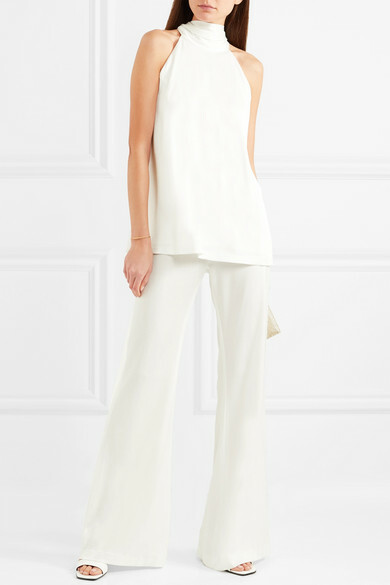 The combination of flowing top and flared pants made from satin make these Galvan pieces elegant, classy and still fashion-forward. It is the perfect canvas for accessorizing with dainty jewelry or maybe even a white fascinator. I think that it would be perfect for a spring or summer wedding, perhaps even in a garden or at the beach. This dress made from crepe fabric features a unique cut and many details such as the flared sleeves, which, however, do not take away from the straightforward design. The contrast between the figure-hugging and classic cut and the clever little details make this dress a modern, but very timeless outfit that is more on the elegant side without looking old-fashioned, it would have been a perfect fit for the #royalwedding if you ask me. 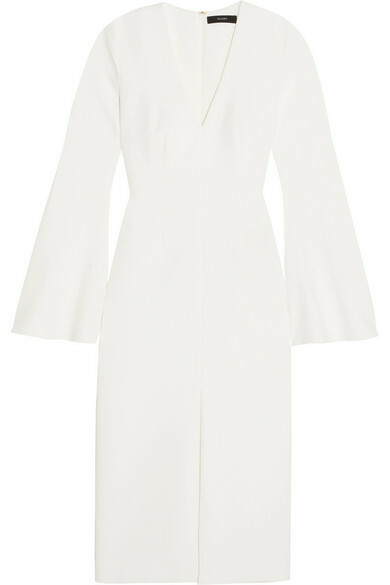 For all the romantics among us, this dress by Reformation is a great option. Made from floral lace and featuring a flared skirt, it is literally begging for flower crown in your hair. However, as you see, even on its own and paired with sleek and minimal make up and accessories, it makes a great look. As if this wasn’t great already, by buying this dress you also help protect our environment. Reformation is a company that manufactures dresses sustainably, environmentally conscious and under fair working conditions. This dress has, compared to making a conventional dress, saved 22 kg carbon dioxide, 9126,6 litres of water and about two kilograms of waste. Emanuel Hendrik is a designer that enables you to individually put together your wedding look. He designs individual body, blouses, skirts and trousers that you can combine to generate a wedding dress (or suit) that truly fits your style and personality. For the civil ceremony, I really liked this skirt. It looks very romantic, but still very sleek and really flatters your figure. 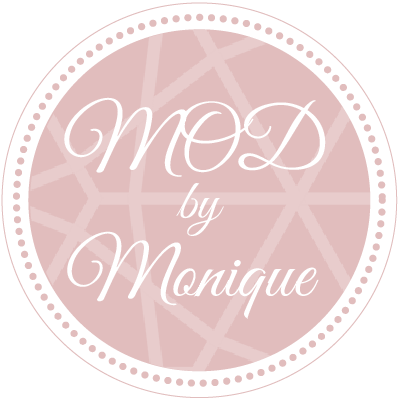 I hope you liked my selection of wedding looks and should you decide to wear one of them on your wedding day, I’d be over the moon if you could send me a picture of your big day! Oh thanks a million dear! I am so glad that you feel inspired! Das ist wirklich eine tolle Auswahl Monique! Ich heirate im Juli und die Inspo hätte ich noch ein bisschen früher gebraucht, denn leider habe ich schon mein Kleid 😉 Aber du hast wirklich schöne Kleider und Anzüge rausgesucht. Oh, das wusste ich natürlich nicht! 😉 Ich freue mich aber, dass dir meine Inspo trotzdem so gut gefällt! Ich wünsche dir und deinem Lieben ein rauschendes und unvergessliches Hochzeitsfest und alles, alles Liebe!